As a bonus, at the end of this post you will see a new video that demonstrates my method of cutting fabric strips for weaving rag rugs. 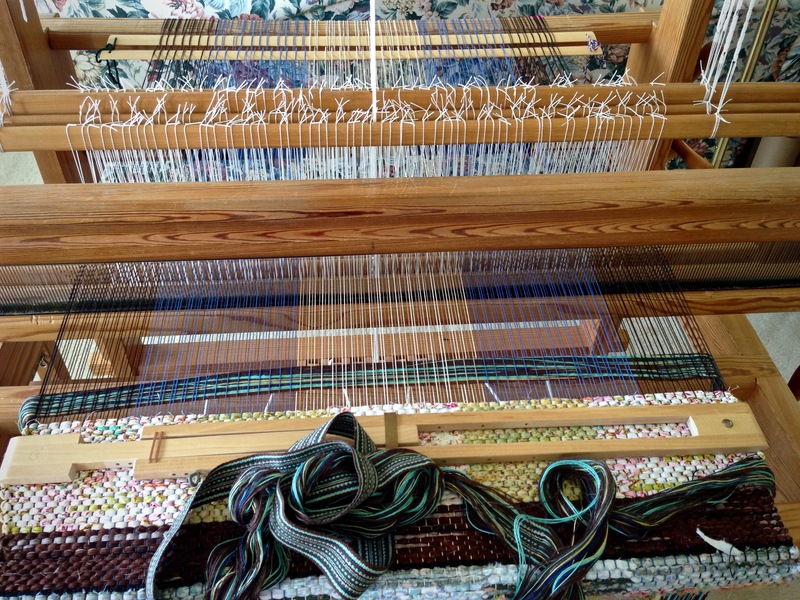 Unwoven warp (length equal to the rag rug warp width on the loom, plus 2″/5cm) comes before and after each of two bag handles, which are woven to desired length. Unwoven warp is held together at the beginning, and in between the two handles, and at the end, with 1″/2.5cm of woven band. 2. Insert unwoven band warp for one handle. Weave approximately 1/3 of the bag. Cut the two handle straps apart in the middle of the 1″/2.5cm woven section that separates the two lengths of unwoven band warp. 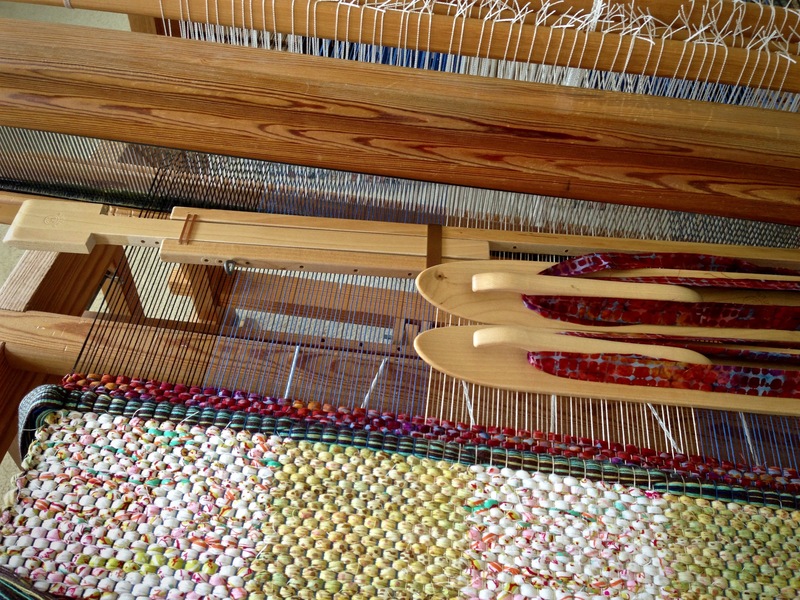 Entering from the right-hand side, insert one unwoven band warp, used here as weft, into the first shed of the double binding weave, with 1/2″/1cm of the band-woven handle strap reaching into the shed. 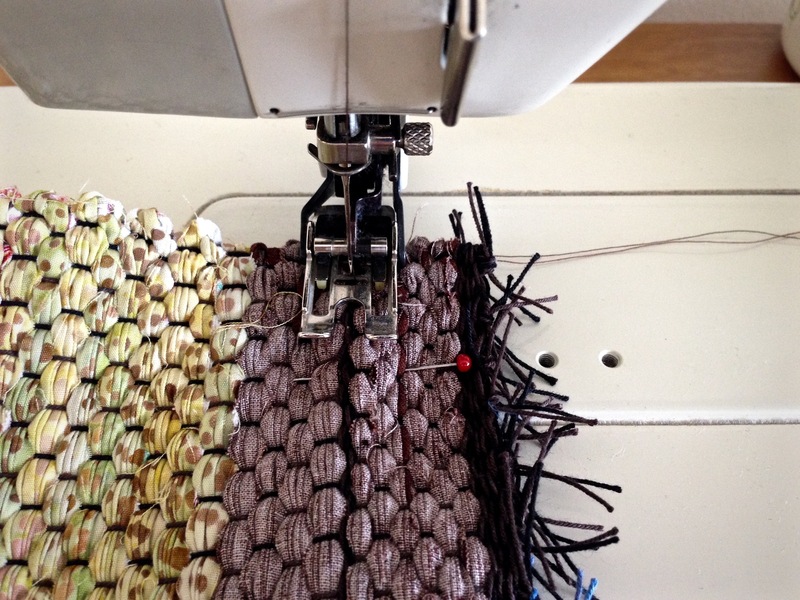 Tap the weft in with the beater, but do not beat it in firmly, yet. 3. Insert unwoven band warp for the second handle. 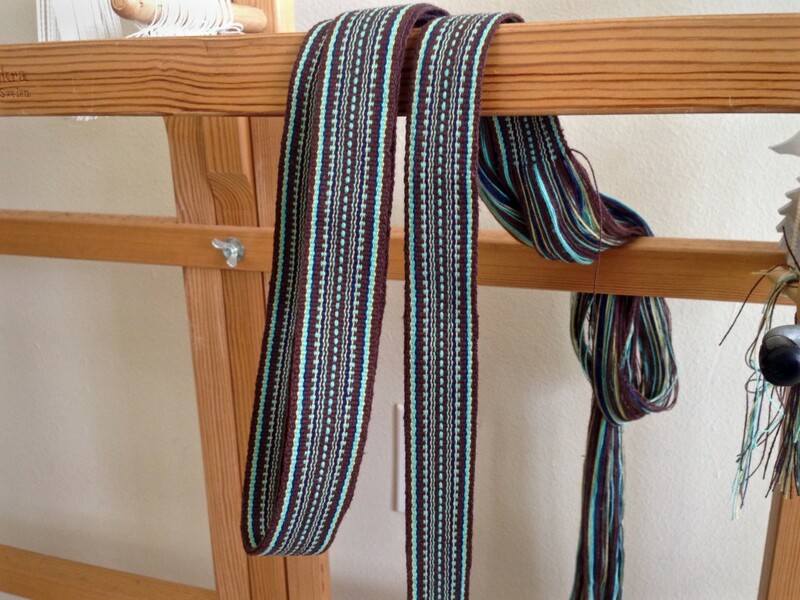 Entering from the left-hand side, insert the unwoven band warp, used as weft, from the second handle strap into the second shed of the double binding weave, with 1/2″/1cm of the band-woven handle strap reaching into the shed. 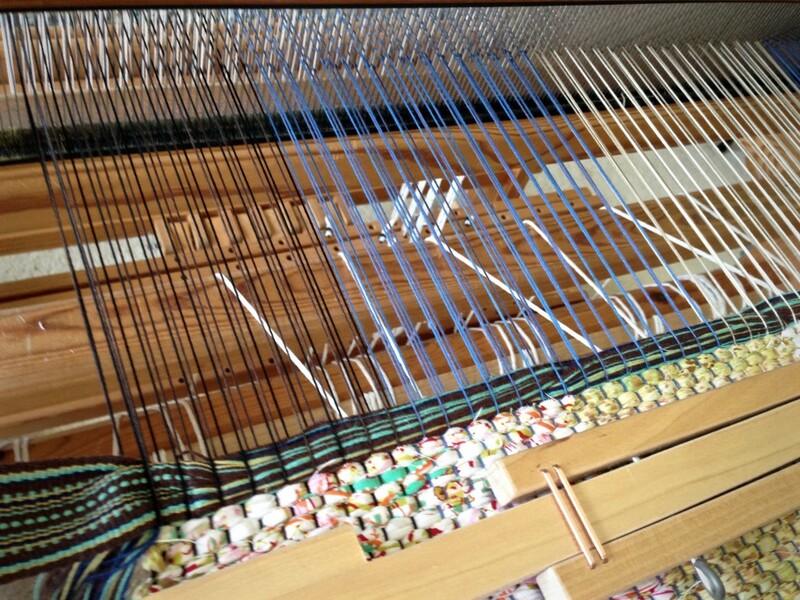 Beat firmly, packing in both layers of weft together. 4. Weave the center 1/3 of the bag. 5. 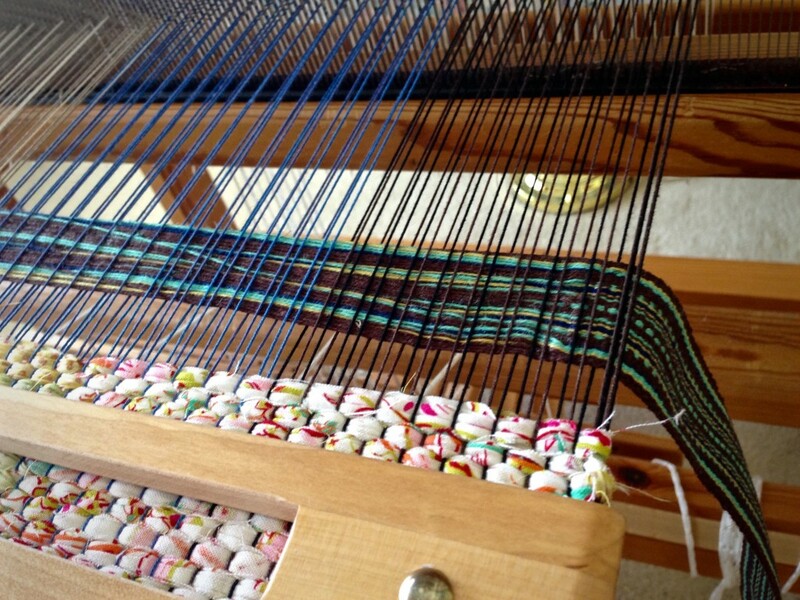 Insert remaining unwoven warp of first handle. Repeat Step 2 with the unwoven band warp attached to the handle on the right-hand side. Make sure the handle strap is not twisted. 6. Insert remaining unwoven warp of second handle. Repeat Step 3 with the unwoven band warp attached to the handle on the left-hand side. Make sure the handle strap is not twisted. 7. Weave the final 1/3 of the bag. 10. Take your bag with you wherever you go. May your ideas turn into fruitful efforts. 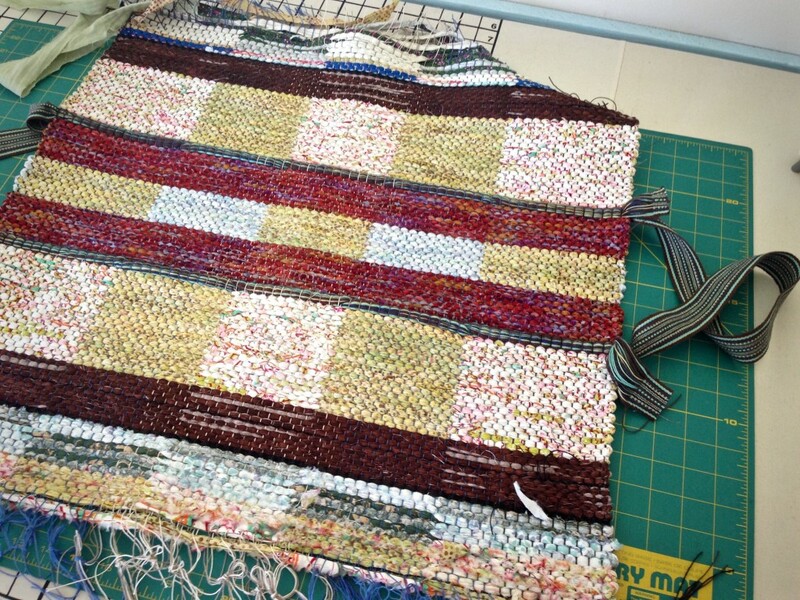 I am really looking forward to making a rag rug, I haven’t tried one yet and I’m thinking if doing one next. I see the kind of shuttles you are using and I’m thinking of buying one like that. What length are yours? I just need a little advice on them. Do you like that kind? 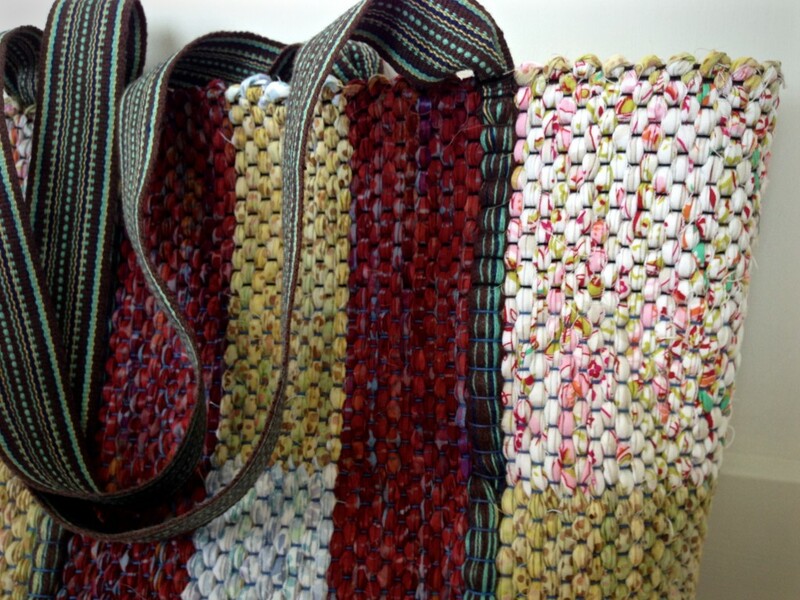 I think you will love making a rag rug! I use 19 1/2″ ski shuttles from Glimakra (besides the one my hubby made for me out of cherry). These shuttles work great for rag weaving. They have a low profile, so they fit through the shed easily, yet they hold a lot of weft. It is also very easy to wind the fabric strips on this type of shuttle. 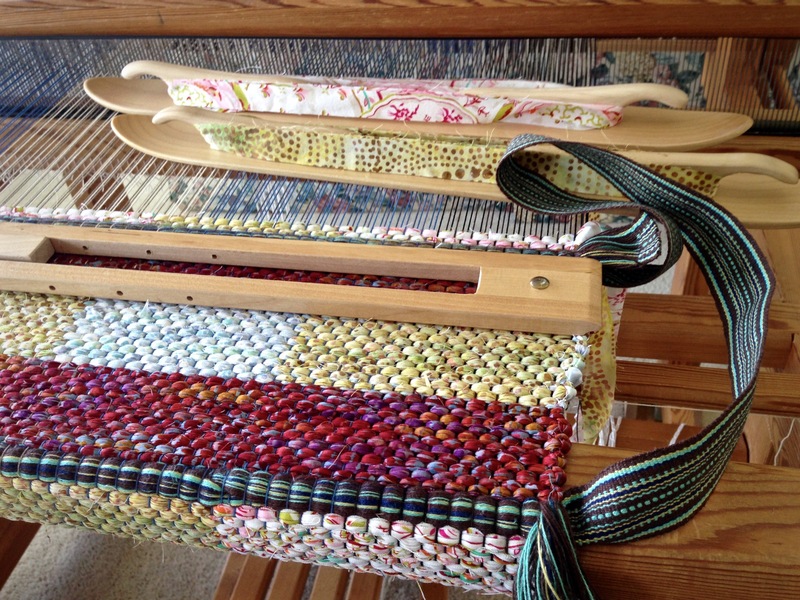 I find that it helps to have at least two ski shuttles, even for a plain, plain weave rag rug, especially if you plan to use more than one color of fabric. 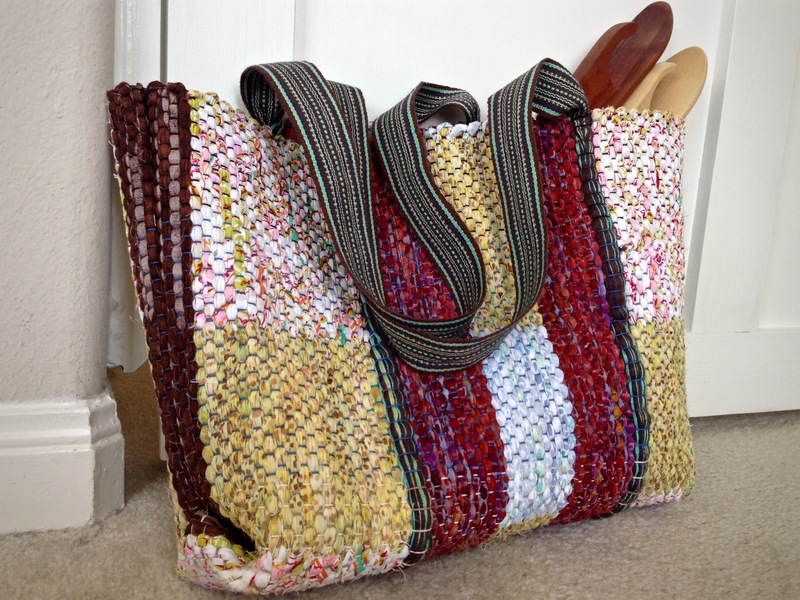 Send me a pic when you have some of your rag rug woven. I’d love to see it!! Thank you for the advice. I just ordered a ski shuttle and some rug warp to give it a try!!! I have been wanting to make something different. So far it’s been just dish towels and scarves. I’ll let you know how I’m doing! Thank you for your bags with handles posts! 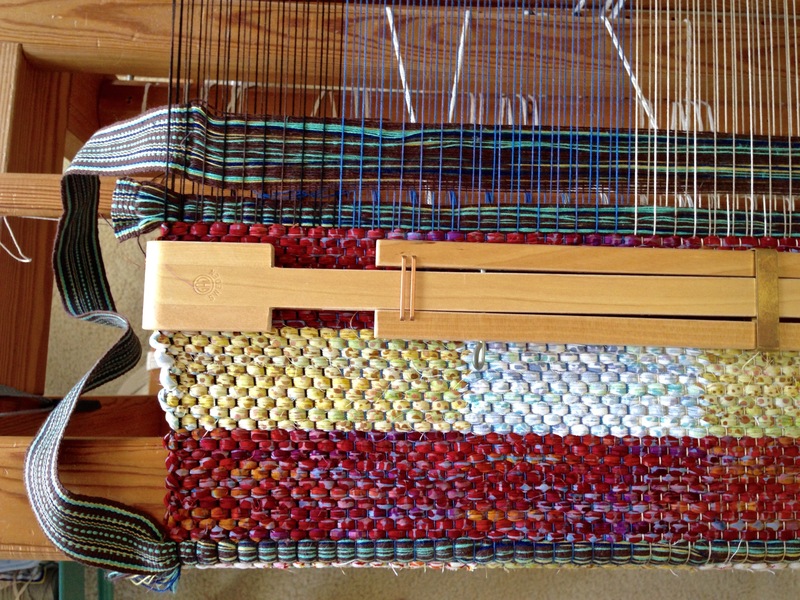 I was trying to figure out how to do this because there isn’t enough warp for a rug left on the loom. Your ideas are a great help! Now to figure out what I want to use for the handles! I have quite a stash of fabrics. I’m thinking I’ll use the idea of sewing the strap and joining the material where it meets in the middle. 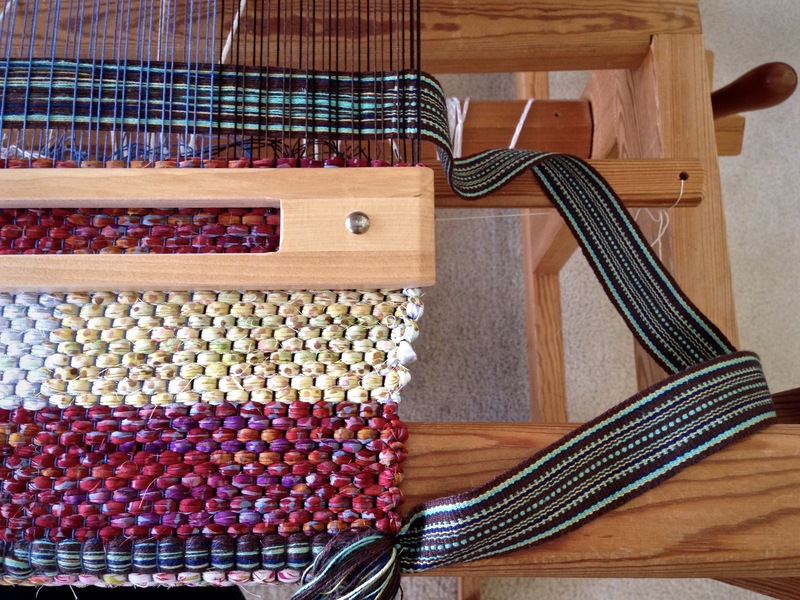 Hi Sandy, Making a bag is a great way to finish out the rug warp on the loom. I think your idea for the handles sounds great. It worked best for me when the part woven in is not too thick or rigid. If you sew the strap and plan to weave it in, keep that in mind.